I have to admit, on that day, I was beyond excited. I forsook all of my studies for exams the upcoming week for the opportunity to attend my first legitimate “Spanish” party. The occasion was watching the Barcelona-Madrid soccer game on television. It was hosted by a group of Spaniards/Catalans at a Spanish/Catalan guy’s house out in the countryside of Catalonia. All there was to eat was white bread and red meat and all there was to drink was various types of alcohol. (A feast planned by Spanish men, indeed!) And I was the only one from the USA invited. After the soccer game and before the dancing began, I found myself outside around the grill with a group of Spanish guys. One of them smiled at me, leaned over, and whispered: “Watch closely. Spain has 46 million people and 46 million potential presidents every election.” I stood with him in the background and before my eyes, I saw an argument unfold – a passionate argument, growing ever-louder, spurred on by the vast amounts of alcohol being drunk – about the fate of Tibet. Just when I thought the score was settled, the argument was further complicated by the presence of a woman from mainland China, who vehemently opposed the Dalai Lama and saw China’s involvement in Tibet as a means of supporting development, rather than a violation of human rights. I am not exactly sure how the argument ended, but one man finally threw his hands up into the air in frustration and sulked into the house. A large faction followed him. Never before had I attended a sports-viewing party with such an engaging and passionate debate. Of course, I knew some about Tibet, but decided at that point in time that I certainly needed to learn more. One of my Chinese friends expressed her disapproval when she saw that I did not have a book on my blog that focused on Tibet. She found some music videos from China on Youtube that celebrated the Tibetan culture – exclaiming to me that Tibet was an integral part of China and helped make her country unique. 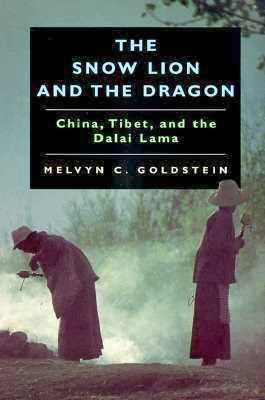 It was her encouragement that led me to purchase The Snow Lion and the Dragon: China, Tibet, and the Dali Lama, from a local used book store. Published in 1997 by the University of California Press, this book was written by Melvyn C. Goldstein, a professor at Case Western Reserve University. This book is a brief overview which details the complex history between China and Tibet, starting from the seventh century CE, when the two regions became unified under the dynasty started by King Songsten Gampo. As my knowledge of Chinese imperial history leaves a great deal to learn, I found some of the information flying over my head. However, there is one thing for certain: Tibet was able to retain its autonomy of religion and its own culture only through the tactful political maneuvering of its leaders. It is also important to note that by the 18th century, the Dalai Lama had lost its political power and had become solely a “spiritual figurehead.” (page 17) The relationship between China and Tibet became increasingly complex when the British conquered Tibet in 1904.